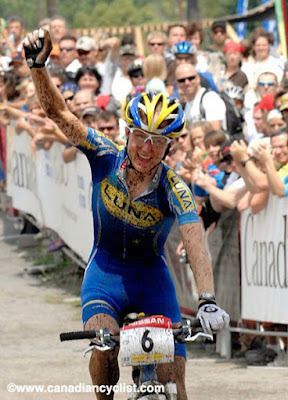 You’d think that to ride to 2nd at a World cup you had this phenomenal day where everything fell into place. So it was weird to be racing in 2nd, but feeling kinda flat, like I was still mentally and physically a little sleepy. It had to be the slowest World cup start I’ve ever done…and the reason I was able to lead the first start loop! I lined up with Gunn Rita Dahle on one side and Marie Helene Premont on the other - no pressure! Gunn Rita set the pace off the start with Marie and I moving up to rematch after last weekends’ close race. I ended up leading the start loop side by side with Marie. This start loop in years past usually saw me drop into the 40’s. Going into the climb I was third wheel. Marie was opening on Gunn Rita and I. Near the crest I knew I should try to lead the woods, but my legs didn’t want to attack for the hole shot. The gap to Marie grew. After the first woods section I made a surge to pass GR and try to hunt down Marie. For 3 laps I chased her down with her opening on the last half of the course and me closing on the first half. The gap stayed under a minute until 4th lap. Behind me, my team mate Georgia Gould was moving up from a bad start and mixing it up with Lene Byberg and Gunn Rita. Katerina was also riding top 8. Go Girls! On 4th lap fatigue was starting to be a factor on the demanding course. 2 weeks on daily thunder showers meant the woods were slow going in mud and slick roots and rocks. I was pretty happy to have tricky conditions, but the mud drained my legs as much as everyone elses and I started to slow as Marie plunged on. The race ended up being almost 30 min longer than Nationals with the course additions and muckier conditions. I was happy again to be on my Maxxis Ignitors. Last lap was one of those rides to survive. I wanted to be able to finish without being caught. I felt pretty good on the major climbs and technical woods, but struggled with the grassy climbs and felt myself giving in to the desire to rest. Lucky The Quebec fans were amazing. Loud cheers spurred me on, as loud or louder than any worlds in Europe. Keith, Heather and Kiara (who is sitting out the world cups due to continuing back pain) as well as my parents and the Hadley family were great, going hoarse from cheering. Riding the last minute into the finish was amazing and I have to admit a little emotional. It didn’t really sink in till then that this was 2nd at a world cup, not a national event. My first World cup medal and a show of promise for our Olympic team headed to Beijing in about 3 weeks! Luna also had a fantastic day with Georgia overtaking Gunn Rita for 4th and coming closing to Lene Byberg’s third place finish. Katerina finished 7th, a little disappointed on the day, but with fire to move up this coming weekend in Bromont. Big congrats to Amanda Sin who claimed 10th with a great ride and Wendy Simms who over came 2 flats to finish in the top 15. Jean Ann also rode a great race to finish 20th. A big Congrats to your "first" World Cup Win today! We are so excited to watch you race at the Olympics! Good Luck from The Timewell's! Say hi to Keith! Just wanted to says belated Congratulations on making the Olympic team and now on your first World Cup Victory! Amazing but not surprising. You've been working your way up the elite ladder for years now with steady and determined training and effort so you deserve it and we're all so happy for you. So, good luck in Beijing and I hope to see you at the 'cross races this fall. Congrats again and keep up the great work! First win with many more to come. Have a great time in Beijing. Wow Catharine - congrats for givin' er great guns! your fans at the David Suzuki Foundation. Wowowow!!!! You are having a spectacular lead-up to the Olympics! I will be watching and cheering from good old Manitoba. Go Catharine and go Canada! Nice work Kika!!!! Way to give 'er. All the best at the Olympics ... Rock the course!